Definition at line 50 of file COutputAssistant.h. Definition at line 101 of file COutputAssistant.h. Definition at line 580 of file COutputAssistant.cpp. References CPlotItem::addChannel(), COutputInterface::AFTER, CCopasiVector< T >::begin(), C_INT32, CPlotSpecification::createItem(), createPlot(), COutputDefinitionVector::createPlotSpec(), CPlotItem::curve2d, COutputInterface::DURING, CCopasiVector< T >::end(), CCopasiObject::getCN(), CPlotColors::getCopasiColorStr(), CFitProblem::getExperiementSet(), CExperimentSet::getExperiment(), CExperimentSet::getExperimentCount(), CExperiment::getExperimentType(), CExperiment::getFittingPoints(), getItem(), getItemName(), CPlotSpecification::getItems(), CCopasiProblem::getModel(), CCopasiContainer::getObject(), CCopasiParameterGroup::getObject(), CCopasiObject::getObjectDisplayName(), CCopasiObject::getObjectName(), CCopasiDataModel::getPlotDefinitionList(), CCopasiTask::getProblem(), CCopasiDataModel::getTaskList(), CDefaultOutputDescription::mTaskType, CPlotItem::plot2d, pTask, CPlotItem::setActivity(), CPlotSpecification::setLogY(), CCopasiParameterGroup::setValue(), CCopasiVector< T >::size(), and CCopasiTask::timeCourse. Referenced by Arguments::prepareModel(), and DefaultPlotDialog::slotCreate(). Definition at line 1263 of file COutputAssistant.cpp. References CPlotItem::addChannel(), C_INT32, CPlotSpecification::createItem(), COutputDefinitionVector::createPlotSpec(), CCopasiTask::crosssection, CPlotItem::curve2d, CCopasiObject::getCN(), CCopasiObject::getObjectDisplayName(), CCopasiDataModel::getPlotDefinitionList(), CCopasiTask::getProblem(), CScanProblem::getSubtask(), CCopasiTask::getType(), CPlotItem::plot2d, CPlotSpecification::setLogX(), CPlotSpecification::setLogY(), and CCopasiParameterGroup::setValue(). Definition at line 1330 of file COutputAssistant.cpp. References C_INT32, CReportDefinitionVector::createReportDefinition(), CCopasiDataModel::getReportDefinitionList(), CReportDefinition::getTableAddr(), CReportDefinition::setIsTable(), CReportDefinition::setSeparator(), and CReportDefinition::setTaskType(). Definition at line 114 of file COutputAssistant.cpp. References CCopasiProblem::getType(), CCopasiTask::steadyState, and CCopasiTask::timeCourse. 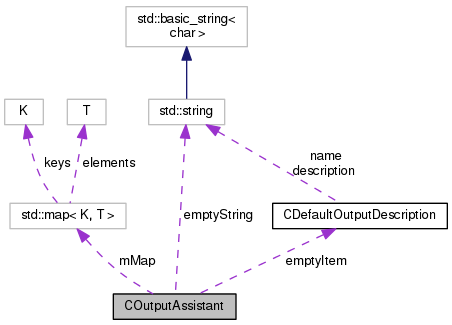 Definition at line 79 of file COutputAssistant.cpp. get complete description of output definition with index id. Definition at line 143 of file COutputAssistant.cpp. Referenced by createDefaultOutput(), and DefaultPlotDialog::slotSelect(). get title of output definition with index id. Definition at line 132 of file COutputAssistant.cpp. Referenced by createDefaultOutput(), DefaultPlotDialog::fillList(), and DefaultPlotDialog::slotSelect(). get a list of indices of output definitions that are suitable for the problem. If problem=NULL (default) all indices in the map are returned. Definition at line 45 of file COutputAssistant.cpp. References CCopasiTask::crosssection, CCopasiTask::getType(), initialize(), mMap, CCopasiTask::timeCourse, and CCopasiTask::unset. Referenced by DefaultPlotDialog::fillList(), and Arguments::prepareModel(). the meaning of the last two digits should be the same in all those cases. Special plots, e.g. for parameter estimation, use numbers 900-998. Definition at line 170 of file COutputAssistant.cpp. References mMap, CCopasiTask::optimization, CCopasiTask::parameterFitting, CCopasiTask::scan, CCopasiTask::steadyState, CCopasiTask::timeCourse, and CCopasiTask::unset. Definition at line 128 of file COutputAssistant.h. Definition at line 127 of file COutputAssistant.h. Definition at line 104 of file COutputAssistant.h. Referenced by getItem(), getItemName(), getListOfDefaultOutputDescriptions(), and initialize().